Hey y'all! Trying to be more active on here (yet again) since I'm ramping up to start featuring stores again this summer. I have a little more extra time since work gets slower in the summer, so I'm hoping to make this back into the platform it was originally intended to be. 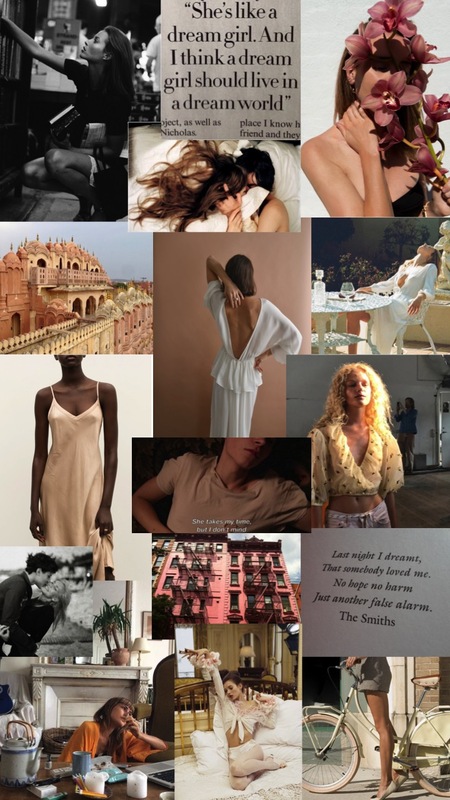 Until then, I was just scrolling through some things I'd recently reblogged on my tumblr and wanted to throw them into a little mood board. The theme is Dream Girl, which is what I intend to feel like all summer long! I'm loving my extra short hair cut, it's the shortest my hair has ever been. I'm feeling very french girl meets Mia Wallace vibes and I'm really happy to embrace the major change. Catch me in the streets of Brooklyn all summer with my massive headphones, straw tote, sundress, and not a care in the world. These are the vibes. As always, I've made a shopping guide below with some brands and new items that I've discovered and lusted after recently. Most everything is depressingly out of my price range EXCEPT the Eggie dress. Have you heard of Jenn Im's clothing label Eggie? It is very cute and you should all check it out.